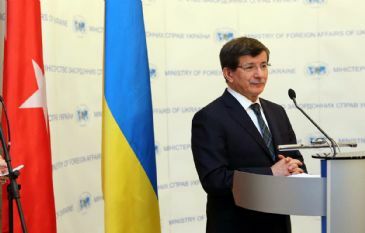 KIEV, Ukraine - Turkey`s Foreign Minister Ahmet Davutoglu stressed Saturday the importance of Ukraine`s territorial integrity, saying, "It is essential for us to protect the status of Crimea and strengthen the presence of Crimean Tatars in the region." Ahmet Davutoglu, who is in Ukraine to hold official visits, and Ukraineâ€™s lawmaker and former chairman of the Crimean Tatar parliament, Mustafa Abdulcemil Qirimoglu, appeared in a press conference following a meeting with Ukraine`s acting President Oleksandr Turchynov in Kiev. Remarking that there are two reasons of Ukraine visit, Davutoglu stressed firstly the strategic relations between Turkey and Ukraine. â€œEvery development in Ukraine is our concern,â€ said the minister. â€œIt is our concern in terms of economic and political stability of the Black Sea, Eurasian peace and relations with Russia,â€ he added. â€œUkraine`s domestic peace is important to us,â€ Davutoglu stressed. The Turkish foreign minister said second important part his visit is to discuss latest developments in Crimea. â€œCrimean Tatars are the essential elements of the Crimea, they are owner of the land and they have the will to live in peace as equal citizens of Ukraine,â€ said Davutoglu. â€œTurkey stands by Ukraine and would make every attempt to protect the rights of Crimean Tatars,â€ he added.